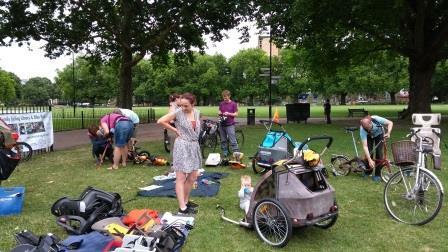 Come to our bumper long session on Sunday 3 September in London Fields by the Lido, 10am - 12:30pm! Borrow family cycling kit for the school run. Try getting the kiddos there by bike! It's free, but donations are welcome - we'll be setting up a donations page. Drop in any time from 10 until 12:15 (we finish at 12:30), then stay for an informal picic afterwards (if the weather permits!). If you're returning kit you've been borrowing, please arrive at the beginning of the session, to give others a chance to borrow the kit too.